Your home’s bathroom should be a place of relaxation and peace. Yet, there are many potential hazards that could affect this environment and pose hazardous health risks. These are some of the most common and how you can avoid them. Those shiny floors might achieve the modern bathroom style you’re going for, but they can also be very dangerous. Slip and falls are a serious health hazard and may be prevented by installing non-slip flooring material. If you purchased your home with slippery flooring materials and you are not yet ready to renovate, consider investing in quality rubber-backed bathroom mats. Place them in especially slippery places, such as in front of the shower and bathtub. Mold and mildew are fairly common in the bathroom because of the consistently damp environment. According to the CDC, mold can cause a variety of serious health effects. Fortunately, there are ways to both prevent and treat bathroom mold and mildew. Mold can grow on any surface with organic matter. Keep moist areas of the bathroom regularly cleaned to prevent the growth of mold. Improper ventilation can also lead to increased mold growth, so make sure your bathroom exhaust fan is working properly. Also, repair any broken grout or tiles to prevent mold from growing behind them. You hang shower curtains for added bathroom privacy and to keep the heat in the shower. Although shower curtains do achieve a sense of privacy, they can also be potentially hazardous to your health. That distinctive odor of a new shower curtain might remind you of freshness and cleanliness, but that smell is actually attributed to noxious odor. The Environmental Protection Agency (EPA) found that there are seven harmful chemicals in traditional shower curtains. You may avoid these health hazards by purchasing shower curtains that are made with PVC or vinyl materials. Most of us are careful to avoid bacteria in public bathrooms. We go to great lengths to avoid touching public surfaces and to thoroughly wash our hands. Yet, many people do not take these same precautions in their own bathroom, trusting that they are properly clean. In actuality, your bathroom is filled with germs. Some of these germs are natural and not harmful. Others though, carry health risks such as gastrointestinal viruses, allergies, and even Athlete’s Foot. Fortunately, regular cleanings will significantly reduce the number of pathogenic germs in your bathroom. 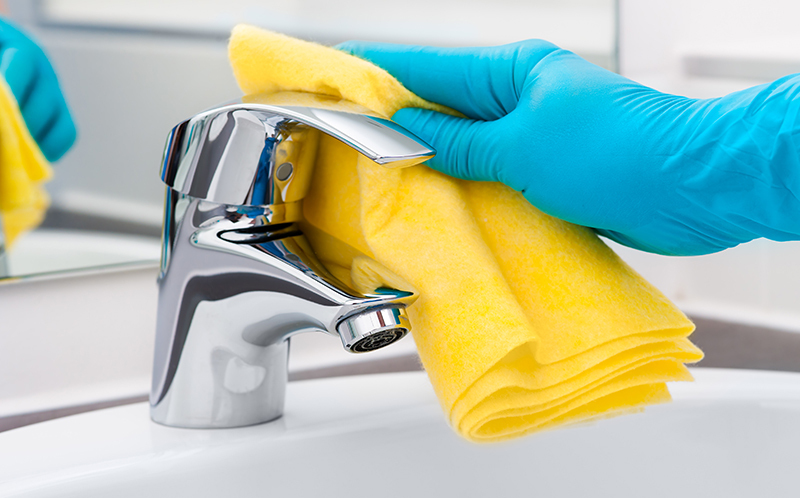 It is likely that you have a variety of cleaning and chemical agents in your bathroom. Many of these chemical agents pose serious health risks through inhalation and skin absorption including Bleach, Ammonia, Chlorine, and Sodium Hydroxide. These chemical products can also be especially dangerous to small children. You can avoid these health risks by wearing appropriate protective gear while cleaning and keeping them out of reach of small children. Choosing organic cleaning products that contain only all-natural ingredients may be a better option for your home. The bathroom can be your sanctuary of peace and quietness or it can be a potentially health hazardous environment. Make sure you are aware of the most common bathroom health hazards and take the appropriate steps to avoid the risks. This post was written for Realty Executives by Heather Hardy. Heather is an avid writer who has contributed to numerous blogs and internet news sources. While she writes on a variety of topics, her specialties include real estate, home improvement, and travel. After obtaining two degrees, Heather has found her passion in writing content that improves both readability and knowledge.